When Was Beach Volleyball Invented? When? Where? How? By Whom? Beach volleyball invented in 1920. 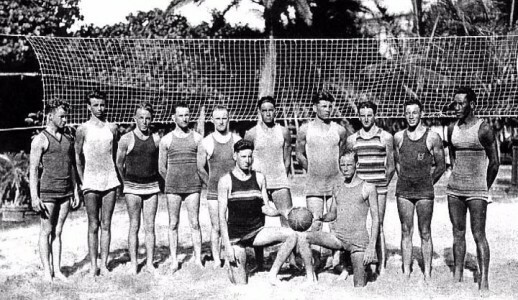 The first volleyball on the beach most likely played in 1915. With roots that date back into the 1800s, beach volleyball history has taken some interesting twists and turns on its way to Olympic recognition. Through the years, the game, its organizational level and its players have enjoyed many triumphs. 1895 - William G. Morgan, the physical director of the Holyoke YMCA, creates a game called mintonette. This derivative of baseball, basketball, tennis and badminton later chances its name to volleyball. 1900 - William Morgan's game of volleyball spreads to Canada, which is known as the first country outside the U.S. to enjoy this sport. 1918 - By this year, volleyball had spread to such countries as Cuba, Japan, France, China and most of Europe. During World War I, U.S. troops helped spread this sport. Beach versions of the game likely began to appear during this time. 1920 - This was a major year in the history of volleyball and beach volleyball, as well. 1920 saw the very first doubles championships held in Philadelphia at the Germantown YMCA. It was also during 1920, that Santa Monica, California, is credited with establishing the first beach volleyball courts. This, in essence, was the true kickoff for this sport. The very first beach volleyball games had been taken place in Hawaii, on the Waikiki Beaches in Honolulu - at the Outrigger Canoe Club. From there the sport spread to Southern California and become popular past time. 1924 the first beach volleyball tournaments were played in California. The game was more recreational in 1920's and often played with 6-men teams. On public beaches families and friends showed up to play with 3-men or 4-men teams - depending how many people were present. 1920-1930 - Beach volleyball continues to spread around the world between the 1920s and 30s. By 1930, the game appeared in such international locations as Bulgaria, Latvia, the Czech Republic and France. The two-man version of the sport began to popularize as players in Santa Monica started playing the game in this fashion. in the Early Years of Volleyball Already. It is written Paul "Pablo" Johnson was the one of the pioneers in two-man Beach Volleyball. In the summer of 1930 in Santa Monica he was waiting people to show up to play six-man game in the beach - until decided to try to play with four people who were present. 1944 Santa Monica Recreation Department hosted four tournaments for two-men teams in Beach Volleyball. In the next couple of years similar tournaments were played in Santa Monica and Long Beach. 1947 - It was in this year that first tournament took place on State Beach in California. The two-man event had no prize money on the line. 1948 - The first tournament with a prize (a case of soda) was held on State Beach. 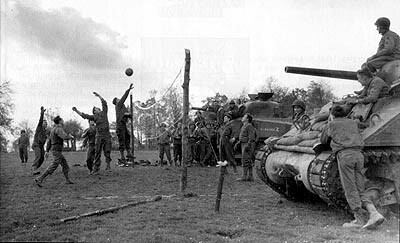 US Soldiers playing volleyball in World War II 1944. World War I and II. Tournament play became a very big deal during this decade as the first circuit was organized among players on Corona del Mar, Laguna, San Diego, Santa Barbara and State beaches in California. The unofficial tour is established in California - some tour stops paying little amounts of prize money. Women start getting more involved in Beach Volleyball. Mixed doubles games are played first, then later women's extend their participation to two-women teams. Also, the first newspaper-sponsored event took place in Brazil during this decade.